Very similar to glass washers, but have a rotating upper wash arm and are generally placed in or on a work surface or in tight spaces. The most significant difference between smaller models and their more substantial equivalents is a restriction in clear entry height, preventing larger crockery items (such as big dinner plates) from fitting inside the machine door. However, they are ideal for snack plates, side plates and other crockery items such as saucers. They will typically have between a 1 and 4 minute wash cycle time that cannot be adjusted by the machine operator. Usually, you will only find them available with a standard 13 Amp UK plug as the power draw required to heat water is not sufficient to need hardwired connection. 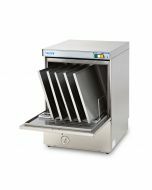 Very similar to glasswashers, but have a rotating upper wash arm and are generally placed underneath work surfaces or on dishwasher stands. They will often have between a 1-4 minute cycle time, which can be selected between two different variants by the operator, depending on soiling of the plates. The most significant difference between smaller options is that the increased clear entry height makes them capable of washing larger crockery items (such as a big dinner plate and serving platters). Typically, you will find them available with both 13 Amp UK Plug and various hard-wired power connections up to 30 Amp. This is because the increased washing capacity requires more power to heat a larger volume of water. They will tend to function quicker the higher the power rating. Allow loading and access to the wash tank via a lift-able hood rather than a front-loading door. Typically each machine can be configured to work in either a 90-degree corner or straight through (against a wall) operation. Otherwise similar to large under counter machines in terms of washing output, the layout and design is more ergonomic to use and allows for loading of larger items and greater throughput This is why you will often hood washers installed into dedicated wash spaces with pre-wash and drying areas. Specialist sinks or entry and exit tabling is usually bolted to the machine sides to extend working spaces. 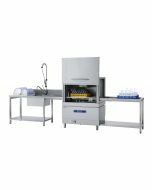 Utensil dishwashers or as they are often known tray dishwashers, or pot washers are commonly used to clean bakery equipment and cooking utensils. Their increased entry height (and potentially larger basket sizes) allow larger items to enter the washing cabinet. They will often have a 1-8 minute cycle time to cater for heavily soiled items (when compared to standard dinner plates). Power configurations generally require a hard-wired connection to mains supply (either 30 Amp or 3 Phase) depending on the size of the machine and the desired operating speed. Often used to clean dishes, glasses and cutlery on a large volume scale. Baskets of dirty items are placed onto a conveyor system that then automatically pulls the washables through the washing system and deposits clean baskets onto exit tabling on the other side. Items are typically specified to a customer's requirements (in terms of sizing, capacity and functionality) before the manufacturer completes installation as part of a full washroom installation or refurbishment project.